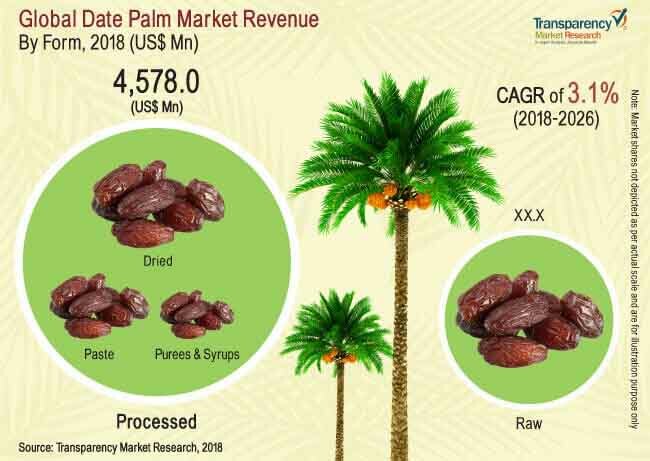 The global date palm market landscape is extremely fragmented and competitive, according to a new report by Transparency Market Research. The date palm market is expected to remain fragmented due to the presence of a large number of small players around the world. A majority of the companies in the market are adopting newer processes and advancements to improve the manufacturing and quality of dates. Some players are also seeking new markets to expand their geographical reach. Growing competition and lower bars to entry are expected to keep this market a robust and dynamic landscape in the near future. Some of the key players in the date palm market are Best Food Company LLC, Natural Delights, Bayara Saudi Arabia Ltd., Groundworks of Palm Beach County Inc, and Al Barakah Dates Factory LLC. As per the TMR report, the date palm market is likely to expand at 3.1% CAGR during 2018- 2026. The date palm market is expected to register a steady growth driven by increased demand for natural and organic varieties of dates. Growing health consciousness and increased credibility of these products due to certifications are expected to drive the growth of the market during the forecast period. Date palms have always been an important source of fibers, nutrients, and vitamins. Dates are increasingly preferred as a key ingredient in the dietary supplements, and in production of functional food, nutritional bars, and the like. The demand for date palms is all set up to witness a splendid surge. A regular sized energy bar can use as much as 20 dates per unit. Growing fitness craze and increasing standards for health are expected to drive the date palm market during the forecast period. Moreover, increasing investments in date manufacturing are helping companies boost their capacity to a whole new level. Additionally, increasing cultivation of palms in Mediterranean, Europe, and the Middle East is expected to result in lower prices and more varieties of dates in the market in the coming years. Health concerns are changing consumer preferences across many industries globally, especially in the food and beverages industry. Product innovations in date palm market are expected to drive these changes during the forecast period. Dates increasingly represent a natural sweetener which is safe and healthy to use in snacks. Its growing reputation and increasing pressure on snacks maker to find healthy alternatives to sugar are expected to drive the date palm market. Consequently, dates are increasing in demand in bakery and confectionary products. Dates not only enrich the quality of these products but also enhance the nutritional content. Confectionary products in the Middle East countries are diversifying to include date-based chocolates. The current difficulty of obtaining dates, often from remote regions around the world, is expected to hinder the market growth during the forecast period. The ideal weather conditions for growing date palms also exist in specific regions. Soon, various companies the market are expected to advance manufacturing processes to make way for a more cost-effective and robust production to maximize revenues.